The rugged and reliable DFC-120 Collator in-line with the DBM-120 Bookletmaker offers commercial, in-plant, and quick printers as well as educational institutions a cost effective solution to their collating and finishing needs. The DFC Series is so easy to use, all the user has to do is just place the required number of sheets into the bins, choose the collating mode, and it the machine does the rest. There will be a total count that will record the number of sets collated or you can input the number of sets required and the machine will count down until it is finished. 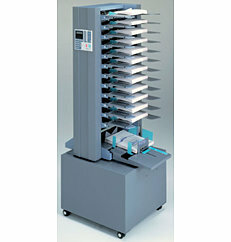 The DFC series features an Alternative Mode which enables the collating stations to be paired-up, which means that two stations can be loaded with the same amount of sheets so that when one is exhausted, and the collator will automatically switch to the other station allowing the machine to run without stopping for maximum productivity. The DFC Series Collators use three perpendicular rubber feed wheels to take sheets into the machine, which ensures that all the collators can grip all across the leading edge of the sheet. The DFC Series collators can be connected together which allows the workloads to change as it is possible to upgrade to a 2-tower system by simply adding another tower and not buying a whole new collating system. The DFC Series features a LCD control panel which displays the current operating status, a 4-digit ascending/descending counter, and an energy saving mode which helps increase the life of the machine. If you have any questions or are interested in purchasing the Duplo DFC Series Friction Feed Collators, visit us at SpiralBinding.com. We have great pricing on a full line of Collating Machines. Call us at 1-800-631-3572 for more information!